This article is about the particular structure in the city of Rome. For the general structure found in many Roman cities, see Forum (Roman). The Roman Forum, also known by its Latin name Forum Romanum (Italian: Foro Romano), is a rectangular forum (plaza) surrounded by the ruins of several important ancient government buildings at the center of the city of Rome. Citizens of the ancient city referred to this space, originally a marketplace, as the Forum Magnum, or simply the Forum. For centuries the Forum was the center of day-to-day life in Rome: the site of triumphal processions and elections; the venue for public speeches, criminal trials, and gladiatorial matches; and the nucleus of commercial affairs. Here statues and monuments commemorated the city's great men. The teeming heart of ancient Rome, it has been called the most celebrated meeting place in the world, and in all history. Located in the small valley between the Palatine and Capitoline Hills, the Forum today is a sprawling ruin of architectural fragments and intermittent archaeological excavations attracting 4.5 million or more sightseers yearly. Unlike the later imperial fora in Rome—which were self-consciously modelled on the ancient Greek plateia (πλατεῖα) public plaza or town square—the Roman Forum developed gradually, organically, and piecemeal over many centuries. This is the case despite attempts, with some success, to impose some order there, by Sulla, Julius Caesar, Augustus and others. By the Imperial period, the large public buildings that crowded around the central square had reduced the open area to a rectangle of about 130 by 50 meters. Its long dimension was oriented northwest to southeast and extended from the foot of the Capitoline Hill to that of the Velian Hill. The Forum's basilicas during the Imperial period—the Basilica Aemilia on the north and the Basilica Julia on the south—defined its long sides and its final form. The Forum proper included this square, the buildings facing it and, sometimes, an additional area (the Forum Adjectum) extending southeast as far as the Arch of Titus. Originally, the site of the Forum had been a marshy lake where waters from the surrounding hills drained. This was drained by the Tarquins with the Cloaca Maxima. Because of its location, sediments from both the flooding of the Tiber and the erosion of the surrounding hills have been raising the level of the Forum floor for centuries. Excavated sequences of remains of paving show that sediment eroded from the surrounding hills was already raising the level in early Republican times. As the ground around buildings rose, residents simply paved over the debris that was too much to remove. Its final travertine paving, still visible, dates from the reign of Augustus. Excavations in the 19th century revealed one layer on top of another. The deepest level excavated was 3.60 meters above sea level. Archaeological finds show human activity at that level with the discovery of carbonized wood. An important function of the Forum, during both Republican and Imperial times, was to serve as the culminating venue for the celebratory military processions known as Triumphs. Victorious generals entered the city by the western Triumphal Gate (Porta Triumphalis) and circumnavigated the Palatine Hill (counterclockwise) before proceeding from the Velian Hill down the Via Sacra and into the Forum. The original, low-lying, grassy wetland of the Forum was drained in the 7th century BC with the building of the Cloaca Maxima, a large covered sewer system that emptied into the Tiber, as more people began to settle between the two hills. According to tradition, the Forum's beginnings are connected with the alliance between Romulus, the first king of Rome controlling the Palatine Hill, and his rival, Titus Tatius, who occupied the Capitoline Hill. An alliance formed after combat had been halted by the prayers and cries of the Sabine women. Because the valley lay between the two settlements, it was the designated place for the two peoples to meet. Since the early Forum area included pools of stagnant water, the most easily accessible area was the northern part of the valley which was designated as the Comitium. It was here at the Vulcanal that, according to the story, the two parties laid down their weapons and formed an alliance. The Forum was outside the walls of the original Sabine fortress, which was entered through the Porta Saturni. These walls were mostly destroyed when the two hills were joined. The original Forum functioned as an open-air market abutting on the Comitium, but eventually outgrew its day-to-day shopping and marketplace role. As political speeches, civil trials, and other public affairs began to take up more and more space in the Forum, additional fora throughout the city began to emerge to expand on specific needs of the growing population. Fora for cattle, pork, vegetables and wine specialised in their niche products and the associated deities around them. 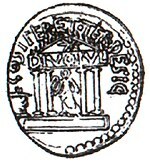 Rome's second king, Numa Pompilius (r. 715–673 BC), is said to have begun the cult of Vesta, building its house and temple as well as the Regia as the city's first royal palace. Later Tullus Hostilius (r. 673–642 BC) enclosed the Comitium around the old Etruscan temple where the senate would meet at the site of the Sabine conflict. He is said to have converted that temple into the Curia Hostilia close to where the Senate originally met in an old Etruscan hut. In 600 BC Tarquinius Priscus had the area paved for the first time. During the Republican period the Comitium continued to be the central location for all judicial and political life in the city. However, in order to create a larger gathering place, the Senate began expanding the open area between the Comitium and the Temple of Vesta by purchasing existing private homes and removing them for public use. Building projects of several consuls repaved and built onto both the Comitium and the adjacent central plaza that was becoming the Forum. The 5th century BC witnessed the earliest Forum temples with known dates of construction: the Temple of Saturn (497 BC) and the Temple of Castor and Pollux (484 BC). The Temple of Concord was added in the following century, possibly by the soldier and statesman Marcus Furius Camillus. A long-held tradition of speaking from the elevated speakers' Rostra—originally facing north towards the Senate House to the assembled politicians and elites—put the orator's back to the people assembled in the Forum. A tribune known as Caius Licinius (consul in 361 BC) is said to have been the first to turn away from the elite towards the Forum, an act symbolically repeated two centuries later by Gaius Gracchus. This began the tradition of locus popularis, in which even young nobles were expected to speak to the people from the Rostra. Gracchus was thus credited with (or accused of) disturbing the mos maiorum ("custom of the fathers/ancestors") in ancient Rome. When Censor in 318 BC, Gaius Maenius provided buildings in the Forum neighborhood with balconies, which were called after him maeniana, in order that the spectators might better view the games put on within the temporary wooden arenas set up there. The Tribune benches were placed on the Forum Romanum, as well. First, they stood next to the senate house; during the late Roman Republic they were placed in front of the Basilica Porcia. The earliest basilicas (large, aisled halls) were introduced to the Forum in 184 BC by Marcus Porcius Cato, which began the process of "monumentalizing" the site. The Basilica Fulvia was dedicated on the north side of the Forum square in 179 BC. (It was rebuilt and renamed several times, as Basilica Fulvia et Aemilia, Basilica Paulli, Basilica Aemilia). Nine years later, the Basilica Sempronia was dedicated on the south side. Many of the traditions from the Comitium, such as the popular assemblies, funerals nobles and games, were transferred to the Forum as it developed. Especially notable was the move of the comitia tributa, then the focus of popular politics, in 145 BC. Particularly important and unprecedented political events took place in 133 BC when, in the midst of riots in and around the Forum, the Tribune Tiberius Gracchus was lynched there by a group of Senators. In 78 BC, the immense Tabularium (Records Hall) was built at the Capitoline Hill end of the Forum by order of the consuls for that year, M. Aemilius Lepidus and Q. Lutatius Catulus. In 63 BC, Cicero delivered his famous speech denouncing the companions of the conspirator Catiline at the Forum (in the Temple of Concord, whose spacious hall was sometimes used as a meeting place by the Senators). After the verdict, they were led to their deaths at the Tullianum, the nearby dungeon which was the only known state prison of the ancient Romans. Over time, the Comitium was lost to the ever-growing Curia and to Julius Caesar's rearrangements before his assassination in 44 BC. That year, two supremely dramatic events were witnessed by the Forum, perhaps the most famous ever to transpire there: Marc Antony's funeral oration for Caesar (immortalized in Shakespeare's famous play) was delivered from the partially completed speaker's platform known as the New Rostra and the public burning of Caesar's body occurred on a site directly across from the Rostra around which the Temple to the Deified Caesar was subsequently built by his great-nephew Octavius (Augustus). Almost two years later, Marc Antony added to the notoriety of the Rostra by publicly displaying the severed head and right hand of his enemy Cicero there. After Julius Caesar's death, and the end of the subsequent Civil Wars, Augustus would finish his great-uncle's work, giving the Forum its final form. This included the southeastern end of the plaza where he constructed the Temple of Divus Iulius and the Arch of Augustus there (both in 29 BC). The Forum was witness to the assassination of a Roman Emperor in 69 AD: Galba had set out from the palace to meet rebels but was so feeble that he had to be carried in a litter. He was immediately met by a troop of his rival Otho's cavalry near the Lacus Curtius in the Forum, where he was killed. During these early Imperial times, much economic and judicial business transferred away from the Forum to larger and more extravagant structures to the north. After the building of Trajan's Forum (110 AD), these activities transferred to the Basilica Ulpia. The white marble Arch of Septimius Severus was added at the northwest end of the Forum close to the foot of the Capitoline Hill and adjacent to the old, vanishing Comitium. It was dedicated in 203 AD to commemorate the Parthian victories of Emperor Septimius Severus and his two sons, and is one of the most visible landmarks there today. The Emperor Diocletian (r. 284-305) was the last of the great builders of Rome's city infrastructure and he did not omit the Forum from his program. By his day it had become highly cluttered with honorific memorials. He refurbished and reorganized it, building anew the Temple of Saturn, Temple of Vesta and the Curia. The last had recently burned and Diocletian's version is the one that can still be visited today. The reign of Constantine the Great saw the completion of the construction of the Basilica of Maxentius (312 AD), the last significant expansion of the Forum complex. This restored much of the political focus to the Forum until the fall of the Western Roman Empire almost two centuries later. The city's estimated population fell from 750,000–800,000 to 450,000 in 450 A.D. to 250,000 by 500 A.D. The populated areas contracted to the river. Strenuous efforts were made to keep the Forum (and the Palatine structures) intact, not without some success. In the 6th century some of the old edifices within the Forum began to be transformed into Christian churches. On 1 August 608, the Column of Phocas, a Roman monumental column, was erected before the Rostra and dedicated or rededicated in honour of the Eastern Roman Emperor Phocas. This proved to be the last monumental addition made to the Forum. The emperor Constans who visited the city in 665 A.D. stripped the lead roofs which exposed the monumental buildings to the weather and hastened deterioration. By the 8th century the whole space was surrounded by Christian churches taking the place of the abandoned and ruined temples. An anonymous 8th-century traveller from Einsiedeln (now in Switzerland) reported that the Forum was already falling apart in his time. During the Middle Ages, though the memory of the Forum Romanum persisted, its monuments were for the most part buried under debris, and its location was designated the "Campo Vaccino" or "cattle field," located between the Capitoline Hill and the Colosseum. After the 8th century the structures of the Forum were dismantled, re-arranged and used to build feudal towers and castles within the local area. In the 13th century these rearranged structures were torn down and the site became a dumping ground. This, along with the debris from the dismantled medieval buildings and ancient structures, helped contribute to the rising ground level. The return of Pope Urban V from Avignon in 1367 led to an increased interest in ancient monuments, partly for their moral lesson and partly as a quarry for new buildings being undertaken in Rome after a long lapse. The Roman Forum was a site for many artists and architects studying in Rome to sketch during the 17th through the 19th century. The focus of many of these works produced by visiting Northern artists was on current state of the Roman Forum, known locally as the "Campo Vaccino", or "cow field", due to the livestock who grazed on the largely ignored section of the city. Claude Lorrain's 1636 Campo Vaccino shows the extent to which the building in the forum were buried under sediment. From about 1740 to his death in 1772, the artist Giovanni Battista Piranesi worked on a series of 135 etchings depicting 18th-century Rome. Renowned British artist J.M.W. Turner painted Modern Rome – Campo Vaccino in 1839, following his final trip to the city. The excavation by Carlo Fea, who began clearing the debris from the Arch of Septimius Severus in 1803 marked the beginning of clearing the Forum. Excavations were officially begun in 1898 by the Italian government under the Minister of Public Instruction, Dr. Baccelli. The 1898 restoration had three main objectives: restore fragmented pieces of columns, bases, and cornices to their original locations in the Forum, reach the lowest possible level of the Forum without damaging existing structures, and to identify already half-excavated structures, along with the senate house and Basilica Aemilia. These state-funded excavations were led by Dr. Giacomo Boni until he died in 1925, stopping briefly during World War I. In 2008 heavy rains caused structural damage to the modern concrete covering holding the "Black Stone" marble together over the Lapis Niger in Rome. Excavations in the forum continue, with new discoveries by archeologists working in the forum since 2009 leading to questions about Rome's exact age. One of these recent discoveries includes a tufa wall near the Lapis Niger used to channel water from nearby aquifers. Around the wall, pottery remains and food scraps allowed archeologists to date the likely construction of the wall to the 8th or 9th century BC, over a century before the traditional date of Rome's founding. 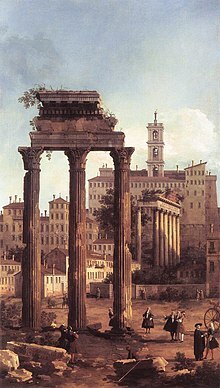 Notable artists of the Forum include Maerten van Heemskerck, Pirro Ligorio, Canaletto, Claude Lorrain, Giovanni Paolo Panini, Hubert Robert, J.M.W. Turner and many others. The Temple of Saturn was one of the more significant buildings located in the Roman Forum. It is believed to have been built in 497 BC and located in Regione VIII Forum Romanum. Little is known about when the Temple was built, as the original temple is believed to have been burnt down by the Gauls early in the fourth century. However it is understood that it was also rebuilt by Munatius Plancus in 42 BC. The eight remaining columns are all that is left of the illustrious temple. Though its exact date of completion is not known, it stands as one of the oldest buildings in the Forum Romanum. The temple originally was to be built to the god Jupiter but was replaced with Saturn; historians are unsure why. The building was not used solely for religious practice; the temple also functioned as a bank for the Roman Society. The Temple stood in the forum along with four other temples. It stood with the Temple of Concord, Vesta, Castor and Pollox. At each temple, animal sacrifices and rituals were done in front of the religious sites. These acts were meant to provide good fortune to those entering and using the temple. Since the Temple of Saturn also functioned as a bank, and since Saturn was the god of the Golden Age, the sacrifices were made in hope of financial success. Inside the Temple there were multiple vaults for the public and private ones for individuals. There were also sections of the Temple for public speaking events and feasts which often followed the sacrifices. The Forum Vinarium, dedicated to the commerce of wine, in the area now of the "quartiere" Testaccio, between Aventine Hill and the Tiber. Other markets were known but remain unidentifiable due to a lack of precise information on each site's function. ^ Grant, Michael (1970), The Roman Forum, London: Weidenfeld & Nicolson; Photos by Werner Forman, pg 11. ^ "La Stampa - La top ten dei monumenti più visti Primo il Colosseo, seconda Pompei". Lastampa.it. Retrieved 25 August 2014. ^ Watkin, David (2009). The Roman Forum. Harvard University Press, Cambridge, Massachusetts. ISBN 978-0-674-03341-2. Retrieved 6 March 2010. , pg 22. ^ A more generous estimate, including the surrounding buildings, would be about 200 by 75 meters tall. ^ Grant, Op. cit., pg 43. ^ Lovell, Isabel (1904). Stories in Stone from the Roman Forum. pp. 8–9. ^ Livy. History. p. 1.38.6. ^ Ammerman, Albert (1990). "On the Origins of the Forum Romanum". American Journal of Archaeology. 94 (4): 633. ^ a b Grant, Op. cit., pg 16. ^ Marucchi, Horace (1906). The Roman Forum and the Palatine According to the Latest Discoveries. Paris: Lefebvre. pp. 1–2. ^ Parker, John Henry (1881). The Architectural History of the City of Rome. Oxford: Parker and Company. p. 122. ^ Vasaly, Ann (1996). Representations: Images of the World in Ciceronian Oratory. Berkeley: University of California Press. p. 61. ISBN 0-520-07755-5. ^ Richmond, Ian Archibald, et al. (1996), Entry, "Forum Romanum", In: Hornblower, Simon and Antony Spawforth (eds. ), The Oxford Classical Dictionary (3rd ed. ), Oxford University Press, pg 607. ^ a b Baedeker, Karl (1903). Italy: Handbook for Travellers. Leipzig: Karl Baedeker. p. 251. ^ Connolly, Peter and Hazel Dodge (1998), The Ancient City: Life in Classical Athens & Rome, Oxford University Press, pp 109. ^ Watkin, Op. cit., pg 106. ^ Watkin, Op. cit., pg 79. ^ The close relationship between the Comitium and the Forum Romanum eventually faded from the writings of the ancients. The former is last mentioned in the reign of Septimius Severus (c. 200 AD). ^ Grant, Op. cit., pp 111-112. ^ Connolly, Op. cit., pp 250-251. ^ Marucchi, Op. cit., pg 9. ^ Goodyear, W. H. (1899). Roman and Medieval Art. New York: Macmillan. p. 109. ^ Carter, Jesse Benedict (March 1910). "A Decade of Forum Excavation and the Results for Roman History". The Classical Journal. 5 (5): 202. JSTOR 3286845. ^ Gray, Mason D. (March 1901). "Recent Excavations in the Roman Forum". The Biblical World. 17 (3): 199. JSTOR 3136821. ^ Pruitt, Sarah. "Forum Excavations Reveal Rome's Advanced Age". ^ Richardson, L. (1 January 1980). "The Approach to the Temple of Saturn in Rome". American Journal of Archaeology. 84 (1): 55. doi:10.2307/504394. JSTOR 504394. ^ Richardson, L. (1 January 1980). "The Approach to the Temple of Saturn in Rome". American Journal of Archaeology. 84 (1): 52. doi:10.2307/504394. JSTOR 504394. ^ Richardson, L. (1 January 1980). "The Approach to the Temple of Saturn in Rome". American Journal of Archaeology. 84 (1): 51. doi:10.2307/504394. JSTOR 504394. ^ Watkin, David, and Watkin, David. Wonders of the World Ser. : The Roman Forum. Cumberland, US: Harvard University Press, 2009. ProQuest ebrary. ^ Kalas, Gregor (2015). Ashley and Peter Larkin Series in Greek and Roman Culture : Restoration of the Roman Forum in Late Antiquity : Transforming Public Space. Austin: University of Texas Press. p. 16. ^ Kalas, Gregor (2015). Ashley and Peter Larkin Series in Greek and Roman Culture : Restoration of the Roman Forum in Late Antiquity : Transforming Public Space. Austin: University of Texas Press. p. 17. Wikimedia Commons has media related to Roman Forum.